A feather is a single part of a whole wing. A single feather can’t fly by itself without being anchored into the hollow bone wing structure. It can try to fly and continually meets struggle and failure doing it alone. Feathers together are the divine system supporting one another to soar into the heavens. That ‘bone’ is the core strength of TEAM. TEAM TO FLY. TEAM PROSPER-US! When there are millions of wings fluttering aloft, a new kind of freedom creates a network Uniting Humanity in Joy, Peace, Love ad Prosperity. In 1996 I participated in LifeSpring Training in New York City: Basic, Advanced, Leadership Training. LP 163, Manhattan, was the toughest, breakdown to breakthrough experience ever. Fifteen years later I continued to cry relating that mountaintop experience. Now its 20 years after the fact; I still do. At this point I am in what was then my ‘yet to be’. In 2015 I participated in an event January 23-25, 2015, in Louisville, KY, that created a new, purposeful YET TO BE for me. Then I was 49. Now I am just about 68. Yikes! Did I say that?! A 23 year old LP brother, Chuck C., wrote our LP 163 mission statement that the team honed. I lettered it in calligraphy, depicting a water spout riding crests of waves using the member’s names, shaped like ripples in the ocean whose ‘ripple effect’ introduced me to a new home and family. with Unconditional Love and Unity. January 23-25, 2015 was a ‘family gathering’ in Louisville, KY. The last talk that weekend ended with the words “We are UNSTOPPABLE”. 12,500 member/business reps jumped up and cheered! 12,500 humans being united in purpose, in a new paradigm business model created to DISRUPT the STATUS QUO, a new methodology of giving back and serving, changing the way humanity MADE A LIVING…LIVING, in 30+ countries and counting… and on stage presenters were the founder, the president, the CEO, all the officers, and members in their 20’s and 30’s that retired from being slaves in ‘corporate America’, along with doctors, layers and other prime professionals who gave up their practices and were making more money with this venture. There is no other company EVER who, for every dollar invested in fees and monthly membership, for every purchase in their Mall, for every buck spent in their booking engine, $.65 of the dollar is returned to the members to spend on future journeys. NO WHERE = NOW HERE… ANY WHERE is this being done. Richard Branson sat down with the founder, took out his checkbook, and said, “I’m writing a number in here. How many zeroes do you want me to put?” “NOT FOR SALE”, was the reply.That’s WHY… I AM ALL IN!! A little over two weeks ago I received an email in my InBox from a woman who lives in Candler, about 30 minutes from me. She had picked up one of my photography brochures, the one with the woman and the skull (I call him Oscar) on the front. I think three brochures existed somewhere in Asheville. After going to my jacquelinesacs.com site, looking around, reading my blog posts, she sent that email saying she would like to meet me. Being a singer-songwriter, multi-talented artist, herbalist with a published book on the subject, she felt a strong connection. Being guided by the same Spirit nudging me, I was drawn to her. Something bigger was calling me. My reply was ‘yes’ to meeting. It felt like a match.com deal. Weird. Definitely unusual and first time ever! But THIS was ASHEVILLE, after all. And if ANYTHING was possible it was possible in Asheville! We met for lunch at Greenlife, near downtown. It appeared we had so much in common. It was uncanny. If she had only been a male and not married… LOL! That’s what I thought at the time. In the conversation she casually mentioned that she was involved in a new business venture, would I like to hear more? I said sure. I had nothing to lose and was usually open to new ideas. ( I gotta mention here that I was bored out of my mind living by myself, finding it very difficult to attract new friends with everyone caught up in their rapid-fire lives and ‘no-time’-agendas). After hearing her ‘story’ and the motivation behind joining this organization, I was ‘intrigued’. She had plenty of experience and know-how in that arena having managed a Radio Shack with her husband previously. This woman, it seemed at the time, was low key, soft spoken and quite the expert imparting information. There was no push, shove, no desperation. There was no product to buy, no check to write out. The video revealed a 10 year old, almost billion dollar company that returned $.65 on every dollar invested by their members. It was a 21st century network marketing system driven home business owners who ‘invited a viewing’ and the video sold itself. That sure appealed to me, who hated selling. Marketing was not my ‘cup of tea’. MAKING A LIVING… LIVING and having fun! If SHAQ, the basketball star/actor signed up as a member, he is hedging on his retirement, with 12,000,000 twitter followers, he CAN’T LOSE! This was a new Quality Management system if ever I experienced one, where the corporate heads are at the bottom of the corporate triangle, feeding and supporting the worker bees, so everyone prospers. Perfect Prosperity includes PERFECT HEALTH, PERFECT WEALTH, AND PERFECT HAPPINESS! Let me tell you: 12,500 people in that auditorium were HAPPY. 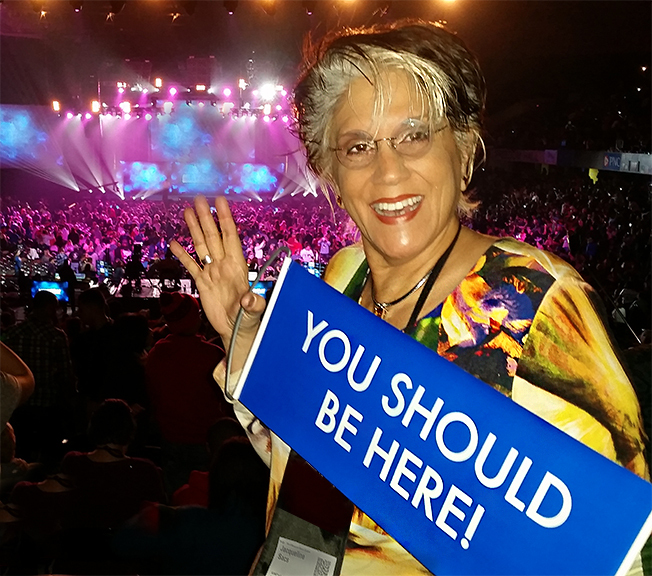 12,500 people were home business office owners. 12,500 people were a small percent of total membership operating the business end, while the remainder just used the other arm of what was offered. Last year 4000 people attended this event. DO THE MATH! There were no pipe dreams expounded in this training… Only methods how to accomplish what we all dream of creating for ourselves and our families and friends… METHODS of accomplishment. One young man is an expression in the Mind of God. His vision expressed Mind’s divine idea. Already a multi millionaire, he shared his vision with trusted friends he knew, respected and shared his energy and wealth. They didn’t need the money. The did need to change the world for the better. What better way than to make it available for EVERYONE TO EXPERIENCE OTHER CULTURES and grow a deeper understanding of the ONE WE ALL ARE! They held his idea in a sacred space and created a spectacular Net, a Web that has multiplied into almost half a million souls in 30+ countries and counting. This time next year, millions will be reaping PROSPERITY from his one idea. WE ARE NOT FOR SALE! “No one built a skyscraper by themselves, or a bridge. It is always created in community”, said Dr. John Waterhouse. When one single feather becomes millions of feathers spreading their wings, using a system/vehicle to do so, humanity is set FREE. When millions FLY the winds of change for good are inevitable. They CREATE A WORLD THAT WORKS FOR EVERYONE, EVERY WHERE. When PRINCIPLE MARRIES ACTION WE ARE UNSTOPPABLE! LET’S GO!